Much like your favorite baseball team, a family's success as a unit depends on generosity, trust, love and respect. Show your passion for your loved ones and for the Washington Nationals with our fine, customized sports decor. 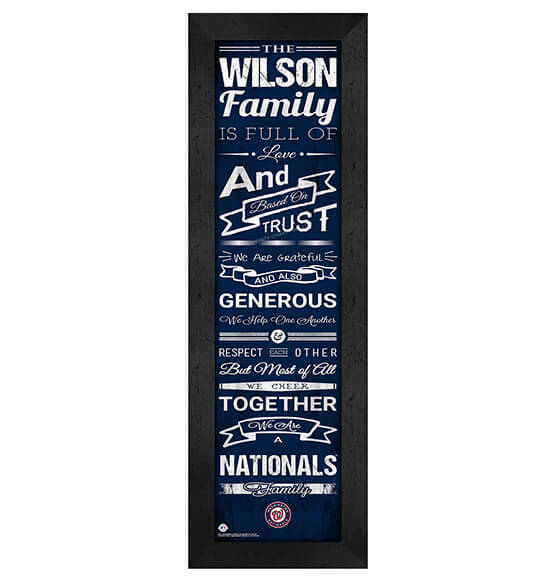 Given as a gift, the recipient will love our Personalized Cheer Washington Nationals MDF vinyl-wrapped, glass-enclosed print that features their family's surname, customizable up to 12 characters. With the team color, team logo and vintage-style script, this personalized artwork feels as American as apple pie and, well, baseball! It comes ready to hang with a convenient sawtooth hanger. This conversation-starter is sure to be a home run.